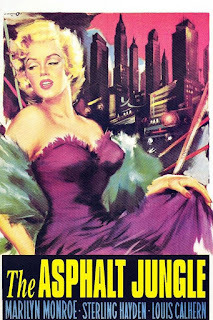 Pictures of Marilyn Monroe may sell films to potential audiences, but her charming and capable performance in The Asphalt Jungle isn't the best reason to watch this noir thriller. 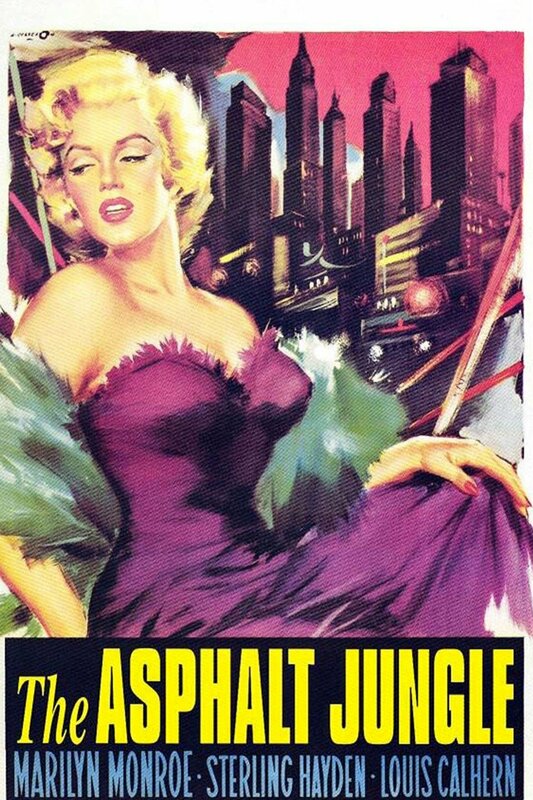 She's too new to movies here, outclassed by Jean Hagen and a sympathetic gang of male criminals. Two actors dominate. A haystack hoodlum played by marine / communist / spy / sailor / novelist Sterling Hayden provides the dishevelled muscle for a jewel robbery. Fellow communist Sam Jaffe's 'Doc' Riefenschneider plays the caper-devising, Homburg-wearing criminal genius straight out of prison, hungry for safecracking and girl-chasing. Two years after directing this film John Huston ran away to Ireland to escape Joseph McCarthy's scrutiny (a strange choice - Ireland being almost a far-right theocracy at the time). With Huston's history, a Jew in the role of a German, and a crooked policeman and two-timing lawyer as the real bad guys, it would be easy to hypothesize strands of subversion here. This, I think, would be a mistake. The actors are fully capable of imbuing their characters with shades of grey without directorial help - Huston's touch remains light. Likewise, we shouldn't read too much into Riefenschneider's confession that he worked as a librarian in the slammer. The inmate-librarian is a plot device in Escape from Alcatraz and a launchpad for all kinds of moralizing nonsense fluff in The Shawshank Redemption (... redemption through books... yawn). In Riefenschneider's case, it shows his attention to detail and his wilyness, the head-below-the-parapet-and-buried-in-refill-pad attitude that lets him plan almost perfect capers. For as fans of the sub-genre know, there's no such thing as a perfect caper.